Are y’all sick of the tomato and herb overload around here yet? Gardens are such a funny thing- ten months of the year, I am looking at the soon-to-be-garden or not-yet-producing-garden or once-garden, wishing for September. And then IN September, the constant hum of the dehydrator and whir of the food processor makes the ‘fun part’ of the garden sort of a blur. 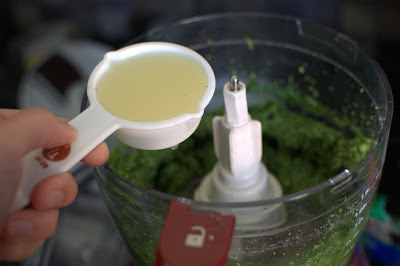 That being said, basil might win the award for Most Useful Item Grown in the Garden just because of this pesto recipe (which, incidentally, might be my favorite perk of the garden…). It’s a toss up between this and the sundried tomatoes (good alone, better together). Too close to call. I’m not exaggerating when I say that we eat a heckuvalota pesto in the winter. Like every week alot (between homemade pizza and pesto pasta). 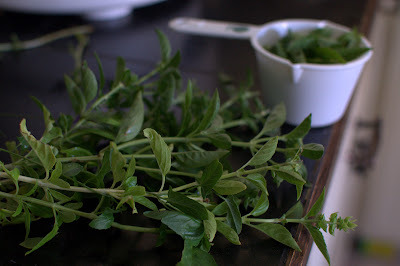 It is delicious, cheap, and, since it freezes well, extends the freshness of the garden (and the financial benefit of the garden) through the winter! To support our pesto habit, we grow a ton of basil. 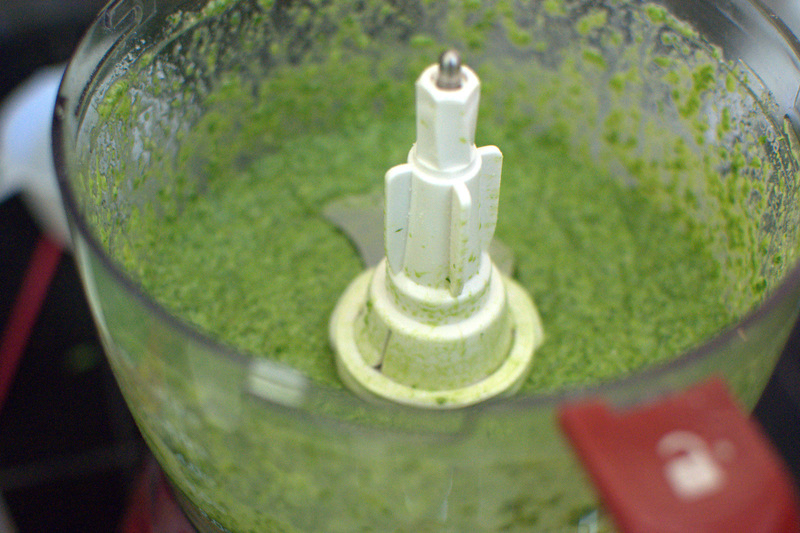 And then I make batch after batch of pesto. Most of it goes into ice cube trays for our winter pesto-ing, but I have to admit that it’s probably best straight from the food processor, dropped in large dollops on into a bowl of pasta with tomatoes from the garden and fresh mozzarella. Mmmmm. *You can just as easily make this entirely with basil (and we sometimes do). 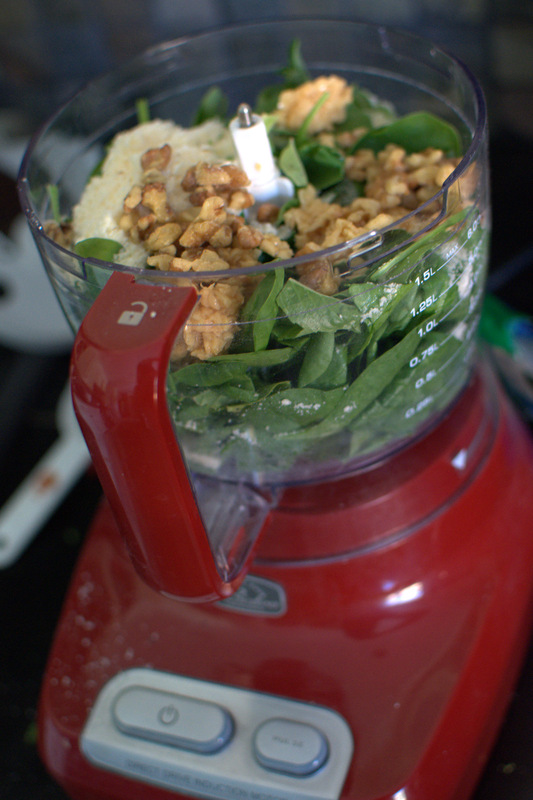 Cutting it with spinach doesn’t change the flavor much, but makes it more affordable. Mix everything in the food processor, minus the olive oil and the lemon juice. Once everything is blended, add in the olive oil and lemon juice and mix. 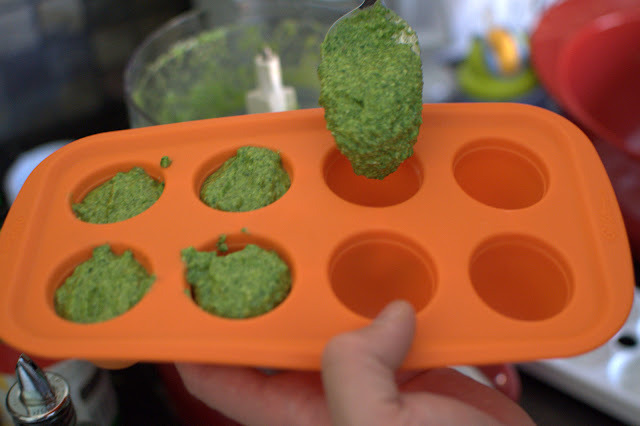 **A note about serving size- we usually use about 5 ‘cubes’ of pesto to make our family dinners. We defrost it first in the microwave if we’re using it on pizza, but, if we’re making pasta, just drop the frozen cubes into a warm pot of noodles- no defrosting necessary. I am super excited about this…thanks for posting…definitely going to try with the spinach! I just made my pesto last week! 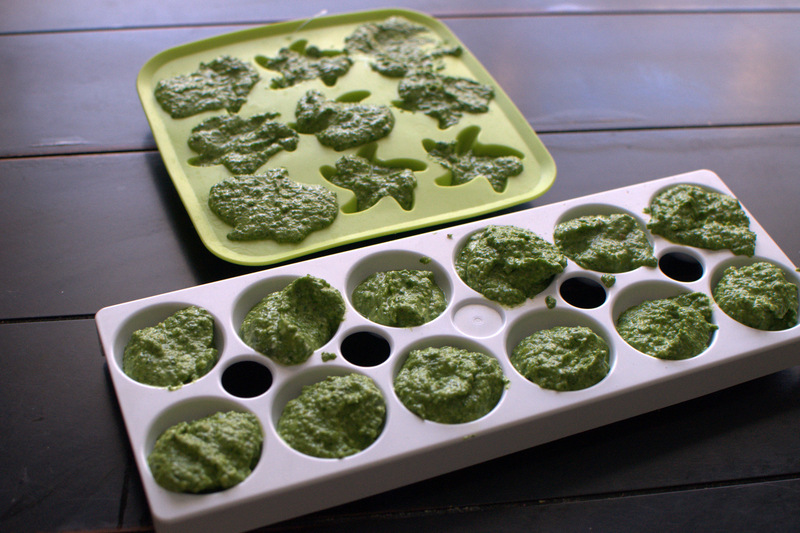 I use freezer containers, and the recipe from the joy of cooking. So good, plus my son is sensitive to tomatoes. Hold the red sauce please! Thank you thank you!!! I was just lamenting last night that our first time garden (this year) had been so fun but I had barely used the spices I just HAD to grow. We've got several intentional basil plants and several volunteers that just sprouted up nearby. I'll be harvesting those all up today!! I know this will work too because we have the same red food processor – it's a guaranteed win. How do you harvest your basil? Do you just pick the leaves off or do you cut and use the whole stem? Also, how long does it take for it to grow back? I’m making this as we speak and I CAN’T wait for my pasta to get done!! !